Okay, let’s lay some ground rules here. This is Silicon Valley. It’s not San Francisco, New York, or even the unfairly-maligned-around-these-parts LA dining scene. From a food and atmosphere perspective, we’re grading on a bit of a curve. Some background: a guy named Oren makes (like everyone, we assume) a gajillion dollars on four successful startups, but finds something still missing in his life. That thing? Authentic Israeli hummus. He teams up with his wife, who conveniently happens to be a successful restaurateur, to bring the flavors of home to the Valley. Fast forward a year or so, and the duo are running the best restaurant on University Avenue. Given that the restaurant is already a favorite of luminaries like Paul Graham, it’s safe to say that millions of dollars of deals have gone down over skewers at Oren’s, with millions more to come. It’s also open until 11 every day, which is like being open until 4 a.m. around these parts. But those aren’t the best reasons to go to Oren’s. The best reason is that the food—from the skewers to the falafel to, yes, the hummus—is consistently, uniformly delicious. You know how you can often tell in one bite whether the guy who made your food actually gives a crap? At Oren’s, they always do. And that’s harder to find than it should be in the South Bay. Oren’s makes excellent hummus. Do I have a sophisticated enough palate to tell if it is truly legendary hummus? No. But if you like hummus, you will dig it. Beware the “hummus entrees”—you are essentially signing up for a bowl of hummus (with toppings) that could serve as a challenge on Man vs. Food. Much better as a side. This is where the magic happens. The chicken, beef, and vegetable skewers are spicy, tender, consistently delicious, and come with two magical sides. This is the sweet spot. “Rip, scoop, eat,” is Oren’s mantra. Follow the instructions. The white pita is perfect. The wheat is inferior and not worth its supposed health benefits. My god, the red chili garlic sauce is good. It’s basically Israeli Sriracha. Put it on pita, meat, quinoa, your finger, whatever. Enjoy. The green sauce has a little more spice and a little less flavor. Solid second place. Knock ’em back with a Goldstar (the Budweiser of Israel). These are on every single menu in Palo Alto. We’ve concluded there’s a municipal mandate that you need them to get Department of Health approval. These are the best, of course—you can actually taste how high-grade the sweet potatoes are and the aioli they come with is absolutely off the chain. Oren’s dominates in the sauce department. Israeli chopped salad, cabbage, beets, carrots, rice, etc. Above-average vegetable preparations, nothing to get too worked up about. This gets special mention because it’s the first quinoa I’ve ever eaten that had flavor. The rest have been at salad bars, admittedly. If hummus is good vodka, this is high-quality scotch—smoky, refined, a must-order. As good as Taim’s in NYC. Sometimes. Depends on the day. Back A Yard is one of our top cheap eats hangs in the Bay Area. La Méditerranée in Fillmore is one of our all-time takeout favorites. Head to Dyafa in Oakland for Middle Eastern food and great cocktails. Order a lot of pita and small plates. 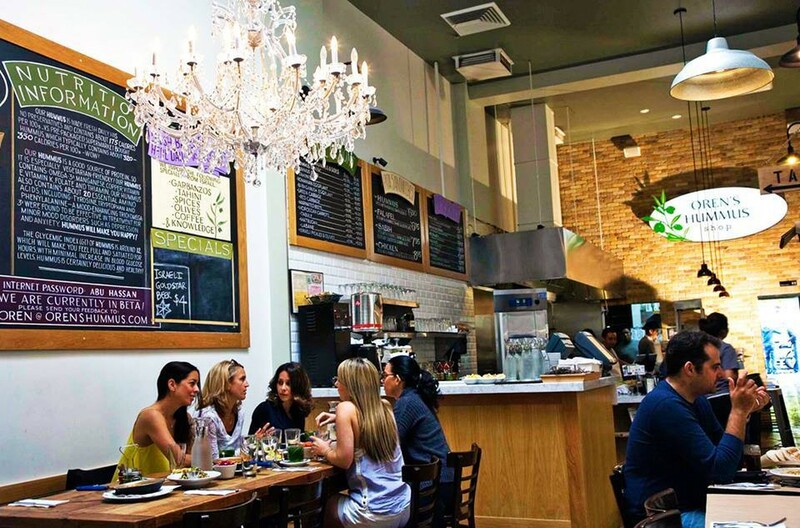 Head to Sababa in the Financial District for quick, good Israeli food during lunch.